You wouldn’t plan a vacation without knowing where you are going, right? A map or an itinerary is not much different than a financial model for your business. A financial model should explain the same core aspects to you and your audience – the who, what, when, where, and how. Save the “why” for your pitch deck – your financial model tells the story about your business and your ability to run it. Most early-stage business owners run and hide at even the slightest mention of the dreaded words, financial model, or even more terrifying, the cash flow forecast! When talking to startups seeking investments, I can almost hear them typing these terms into Google (followed by the word “template”). This seems to be most pervasive among those in college or recent graduates. Perhaps some think the financial model is really just a complex set of rough financial projections used purely to show investors how much money your business can make. Actually, not at all. In fact, one of the main reasons we create financial models is to serve as a valuable tool for internal company decision making, not just to satisfy the needs of investors, board members, banks, and other stakeholders. This misconception is one that nearly every investor wishes founders knew from the start. It also becomes the subject of many discussions at board meetings between founders and investors. 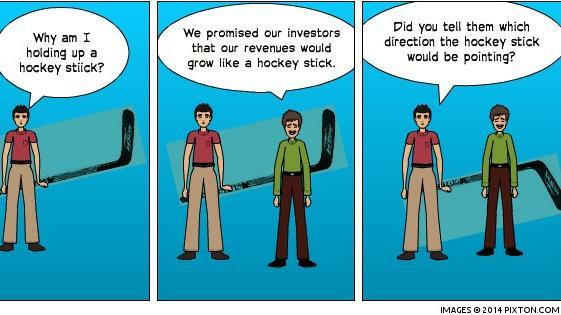 Having seen those seeking funding and those who get frustrated with building a financial model is interesting, especially as we usually see the entrepreneurs pointing to their financial projections to show how amazing of an investment opportunity their company is – just look at those hockey stick projections! In reality, those hockey stick projections let investors know that you are relying too much on assumptions and not enough on understanding the hard work that goes into building a plan for your business. Ok, well then why do investors really ask for a financial model? It turns out, the reason investors and VCs require businesses to develop a financial model has little to do with how much money you think your business can make. Actually, most don’t even care how giant you can inflate your projections to appear on paper. Why? Investors know that 9 times out of 10, your actual results will turn out to be different from your original estimates. That’s the inconvenient truth. What investors are really looking for is your own understanding into how your business operates. Anyone can write down a few projections and call it a financial model. Investors truly want to know you can recognize the underlying factors driving your projections and carry out strategic decisions that are going to kick your plan into gear. Develop a strong revenue growth model and pinpoint Key Performance Indicators (KPIs) that will push that growth. Clearly identify expenses, maintain enough cash to fund those expenses, and explain how those expenditures are necessary in supporting your growth model. Understand how your business will utilize its cash. Investors want to see that you know how long your business’s current cash supply will last and you have a plan for what to do with new capital. As a business owner, when you walk into a room full of prospective investors, it is your job to tell them a compelling story about your business, the problem you are going to solve, and the market that exists for your product. Your financial model should demonstrate you know exactly what resources you need and when to execute on that model. The greater detail you can demonstrate in your planning, the greater the confidence will be in your team being able to execute. As an investor, I have gone into due diligence or follow-up meetings excited to invest in a company. They came to our screening panel, we saw them in the community, and we liked their pitch. Too many times, I have had to walk away from what I saw as a great opportunity because the founder was operating on overblown hopes and dreams and not within their financial reality. Like the founders, angel investors are dreamers as well. We want to see a better future and your success in creating amazing companies that solve big challenges. What separates a dreamer from an entrepreneur, however, is the understanding of how their company can solve those big challenges. I am not talking about a business plan (I don’t even read them) – investors want to understand the numbers (especially the costs) that drive your projections. Without a solid financial model, it is like reading a book with missing chapters. Spend as much time preparing your financial model to tell a story as you spend preparing your pitch deck. I guarantee you the time will be well worth it. You need a model that can illustrate the core drivers of your financial plan, not one that scratches the surface with basic financial forecasts. Most businesses trying to raise capital think that once they’ve presented their financial model to an investor they can just move on and forget about it until the next round of funding. This is usually not the case. First, that investment round you closed just installed a board member who represents your new group of shareholders. You just told those shareholders how you are going to run your business based on your financial model, and the new board member is going to hold you to your word. Second, if you put in the effort, an effective financial model actually has exceptional value to the internal functions of every business. A well thought out model can help a business understand what KPIs are driving revenues and growth, and focus on maximizing their most important drivers. It also can help a business evaluate when it is going to run out of money, and help drive critical decision making for expenditures, investments, and when to raise additional capital. Your model gives you a precise snapshot of where your business is currently, and the direction you are trying to go – an itinerary, if you will. See: The Power and Honesty in a L4M Model. Build One Now. On the surface, an effective financial model might seem like it is a device purely intended for investor presentation. In reality, a well implemented model can yield even greater value to further understanding your own business, and honing in on what truly drives your business’s success. So, a spreadsheet will suffice, right? Well, it is what everyone else is doing. However, we believe there is a better solution. The majority of spreadsheet models out there are based off of overly-complex templates that business owners can’t efficiently pitch to a prospective investor when trying to raise capital. And what is really crazy is some of the most diverse spreadsheet models are still too fundamental to portray a constantly-changing, dynamic business like your own. You need to clearly lay out a financial picture and set of goals, and then prove to investors you have a plan of action in place to capitalize on those goals. Unfortunately, this is a task no Excel workbook is going to be able to help you accomplish effectively. Even more, here is a little-known secret: investors don’t even like excel-based financials. They are simply the minimal required option that exists. For me, I love well-constructed, progressive Excel models. They give me an opportunity to find out where any weaknesses might be hiding in the business assumptions. However, the models always break because spreadsheets lack the ability to simplify a complex business into an array of rows and columns. What’s worse? Most entrepreneurs get lost in their spreadsheets trying to tell a story – their metrics and revenue numbers are inconsistent among different pages, the pitch deck, or other external documents. The weakness in their model is easily uncovered, answers start to seem more like excuses, and the blame is automatically put on the finance manager who put together the spreadsheet in the first place. The result is the investor loses interest. Your business does not get funding. Your time must now be spent getting another meeting with investors – time that could be spent on growing your revenues. Your employees start questioning your ability to lead. Basically, your business is heading in the wrong direction. Oh, and by now it has been 3 months since you last updated your financial model and you have to build an entirely new forecast to account for how your assumptions are all now entirely different. The simple truth is there is no spreadsheet model that will be able to offer you what your business and investors really deserve. Alright… then what do I present to investors instead of a spreadsheet? At Hivemetric, we are developing the tool your business needs to formulate an effective financial model, and to give you a clear understanding of the underlying factors that are driving your model’s projections. That way, when it comes time to raise additional capital and present your business plan to prospective investors, you will have the ability to deliver a clear set of forecasts that investors can actually understand. Because when an investor gives you money, they aren’t just investing in your company. They are also making an investment in you. It is Hivemetric’s goal to give you the resources and knowledge you need to be able to confidently articulate your pitch to a set of investors at any time, anywhere.